If you ask me what I wanted to be 13 years ago, I’d say I wanted to become a doctor because I wanted to cure people. I think all kids will basically give the same answer. What will a five year old kid know about Medical Technology, Physical Therapy, Pharmacy etc.? All they know are doctors and teachers because they are well respected. As for me, at that young age, I wanted to become a doctor because I wanted to cure my grandfather. He was suffering from a disease with a long name I couldn’t spell, at that age. Since then, I became very passionate in science subjects. I wanted to be a doctor immediately. It was in my High school days that I fully understood that you can’t go jumping into doctoring. You need to take up pre-med course first. This is how I came to know about Medical Technology. 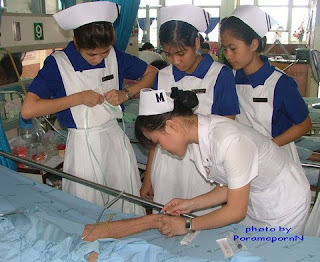 I chose Medical Technology because this is what I really wanted to be in case I can’t pursue the Medical course. I can’t picture myself being in another profession because I can already see myself wearing a lab gown, peeping in a microscope, holding test tubes or performing blood and urine tests. I also believe that Medical Technology is the best profession for me. You’ll know how to perform and interpret lab findings and results. That’s as good as being a doctor already. It’s just that you are not licensed to diagnose. This is also the course where you can exercise leadership fully because there are lots of laboratory works that require a leader. Just last semester, in our Organic and Biochemistry class, I was chosen to be the leader. At first, I wasn’t pleased because of the responsibility I have to shoulder. But as I exercised the Democratic Style in my leadership, I have come to notice that I’m even enjoying myself. And that is not because I’m bossing around. It’s just that my burden was lessened because I am able to handle my small group properly without the â€œyou-are-the-leader-I’m-just-the-memberâ€ sort of relationship. In our experiments for instance, I first asked my members what they wanted me to do: assign them each a separate task to be able to save time or we do the same task and proceed to the next one only when they were done with the first? They chose the former but they were afraid that they might not be able to do their job properly, so I decided to assign the task according to their capacity. I’ll assign the most difficult and complicated one to the most intelligent in the group and so on and so forth. As a result, we were always the first group to finish the experiments and as the leader, I’m so proud of my group mates. To become an effective leader therefore, you should be able to exercise freedom and rapport among your members. They should not feel that you are the leader and you are superior to them. You must always be open for their suggestions and make sure to consult them first before you do something. I also believe that a leader is able to lead, guide, inspire and bring out the best qualities in their members. When it comes to my relationship with my peers, I can say that I can relate to people around me pretty well. I can be approached by anyone. I have no enemies and I can befriend anyone no matter what their status in life is. I also attend to people who approach me and ask for my helping hand not only in academics but also in other matters like swimming, arts, family and even heart problems. I can’t remember turning down anyone who approached me not unless they have financial problems, in that, we’re just in the same shoe. Even people I do not know can approach and ask favor from me. I can still remember when I was in my Senior Year, someone asked me to please join the SCA (Student Catholic Action) club. She said that it is not compulsory and I wouldn’t be receiving any incentives for joining. But still, I signed up because I wanted to have an experience in community service and share my knowledge with others. Everyday at 4:00-5:00 PM, after our class, we go to a public elementary school where we teach catechism. We were grouped in 5 and were assigned to one class. My group mates and I were assigned to Grade 2 section 5. At first, it wasn’t easy because the teacher was out and everyone wanted to go home. In our first meeting, we just introduced ourselves, what we were there for and tried to familiarize ourselves with their names and faces. On the succeeding meetings, we introduced Jesus to them, teach them the Lord’s prayer word by word, told them to pray before and after sleeping and eating, and many more. This lasted for a month. Before finally leaving, we’ve seen a lot of improvements in their personality. They stayed quietly in their classroom waiting for us, they learned to pray along with us, they became polite and call us ate and kuya, which is very much far from what they had shown us in our first meeting. They weren’t the only ones who improved. During that month-long activity, my group mates and I have learned a lot too. Friendship, teamwork, cooperation, patience and many more. We also learned together with our students how to appreciate Jesus in our lives. I can say it was all worth it. It was so nice to feel that you were able to help and change people for the better and at the process, improve yourself as well. 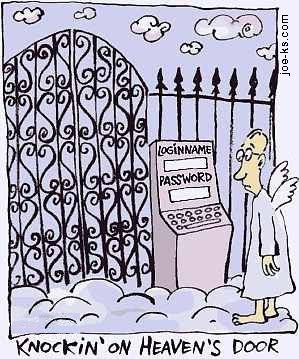 At this point in time, I am already standing in front of my heaven’s door taking up Medical Technology. In spite of financial constraints I am in, because of low family income, I do hope someone will open the door and let me in. Meliza is a a 4th year college student, who will be graduating this April. In spite of the various challenges (financial, emotional, academic) she had encountered and is presently experiencing; she is undaunted and is still striving to fulfill her dreams. May all your goals be fulfilled Meliza, my hats off to you. Great post. I so admire those who do what is necessary to accomplish the goals they set for themselves. The door to heaven is open, come on in, the coffee is great! Yes, you’re right James. These are admirable people and this girl is one such person. Kudos to you Meliza. Thanks James for that wonderful comment. I am sure she will appreciate it a lot. Great post and I am very honored that you chose my avatar to use. Please forgive me in being so late to get back to you but I have bee away for 5 months. By now I guess it time to also congratulations on your graduation.